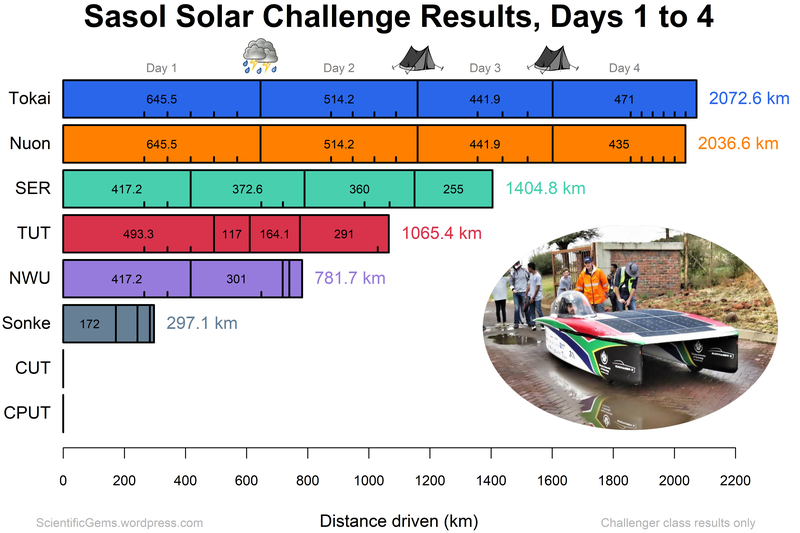 Here are the results for the Sasol Solar Challenge in South Africa, as at day 5 out of 8. Only the Challenger class is shown. The optional daily “loops” are marked, the black spot indicates a time penalty, and the photo is from here (taken on day 4). I have calculated average speeds for the cars (hopefully adjusting correctly for time spent in control stops and loop stops). 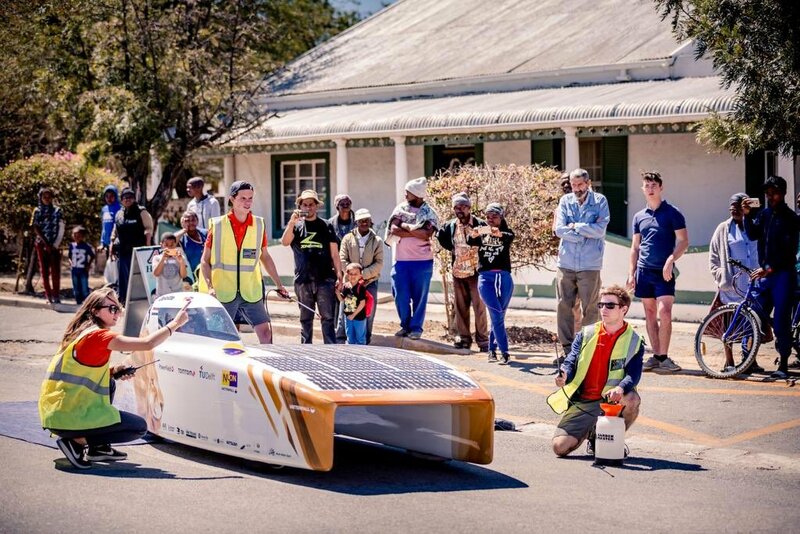 Tokai still holds the lead, Central University of Technology have finally gotten their car to pass scrutineering, and three cars are in a battle for 3rd place. 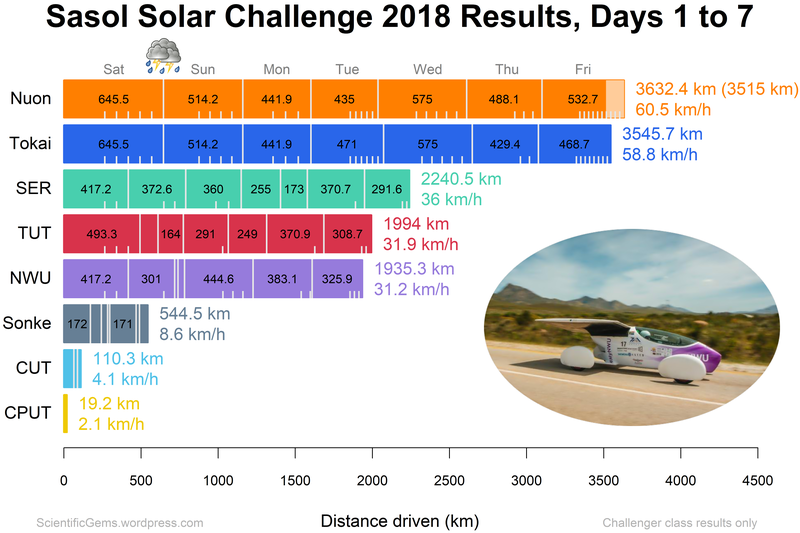 Nuon has some excellent videos about the race (Dutch with English subtitles) for day 1, day 2, day 3, day 4, and day 5. See also the online tracker and my teams list and information page, which includes links to team social media. 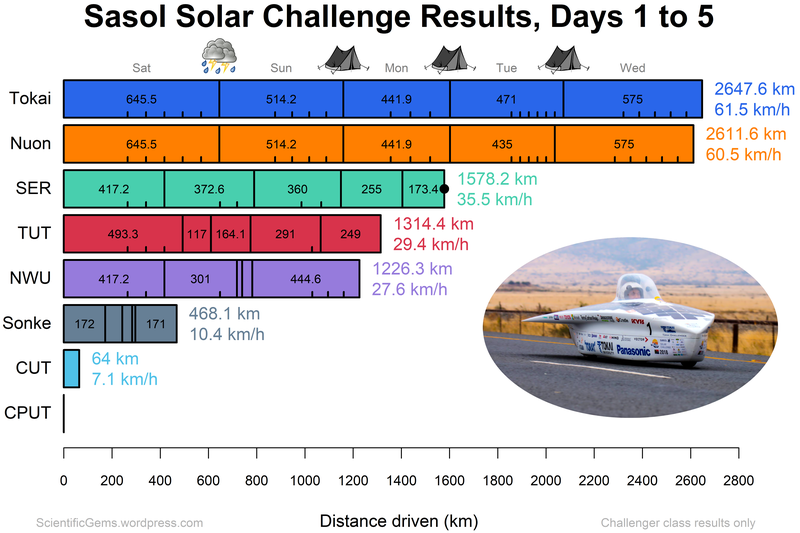 Here are the results for the Sasol Solar Challenge in South Africa, as at day 4 out of 8. 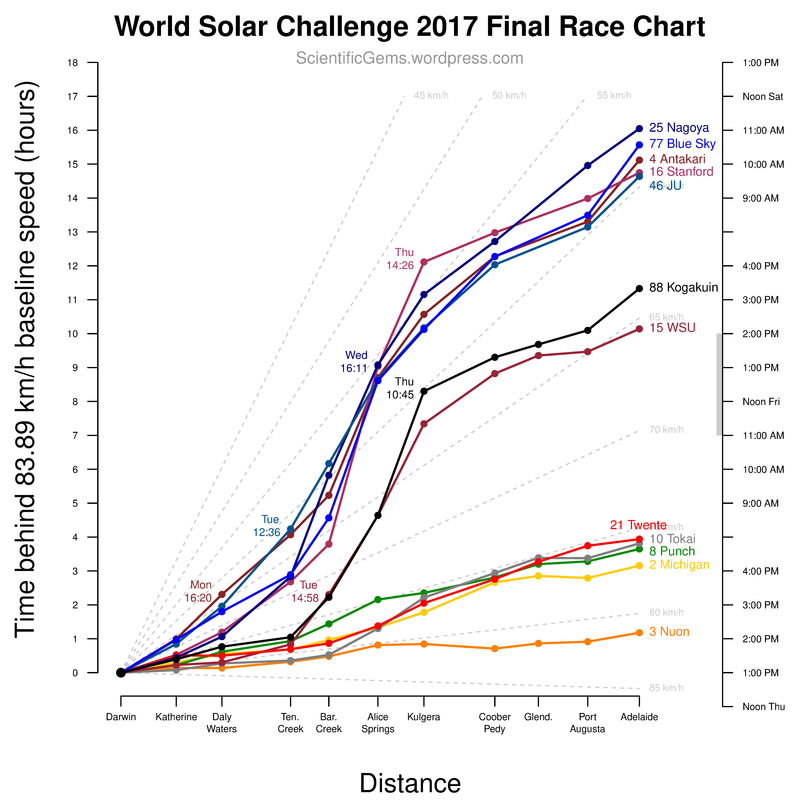 Only the Challenger class is shown (not the car from Hong Kong, which is driving non-competitively). The daily “loops” are marked, and the photo is from here. See also the online tracker and my teams list and information page, which includes links to team social media. 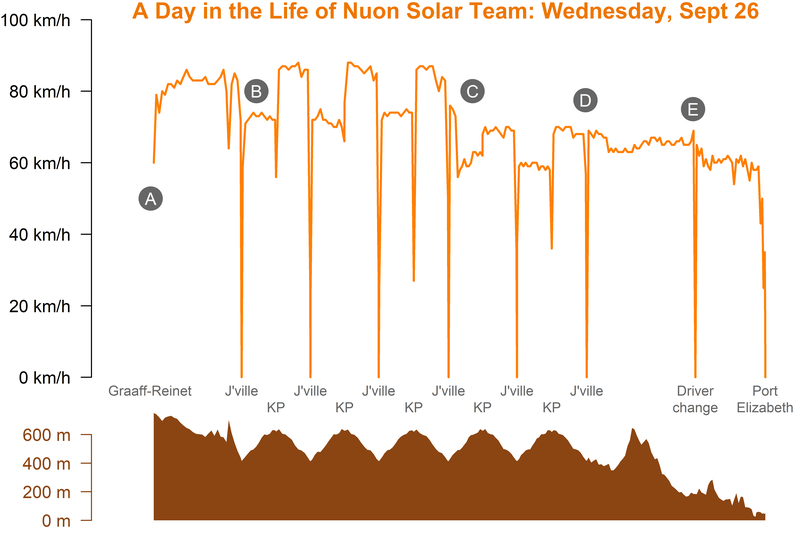 Nuon had some minor technical problems today, allowing Tokai to take the lead. 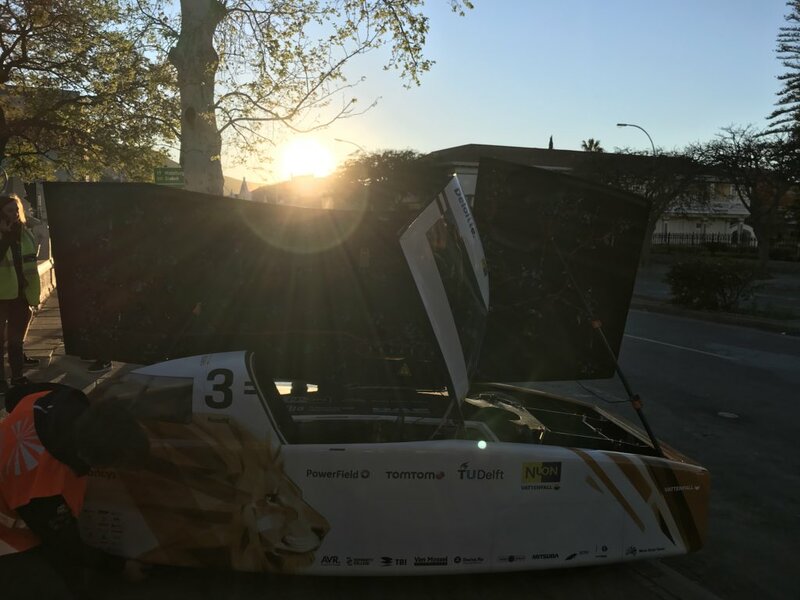 Nuon has some excellent videos about the race (Dutch with English subtitles) for day 1, day 2, day 3, and day 4. 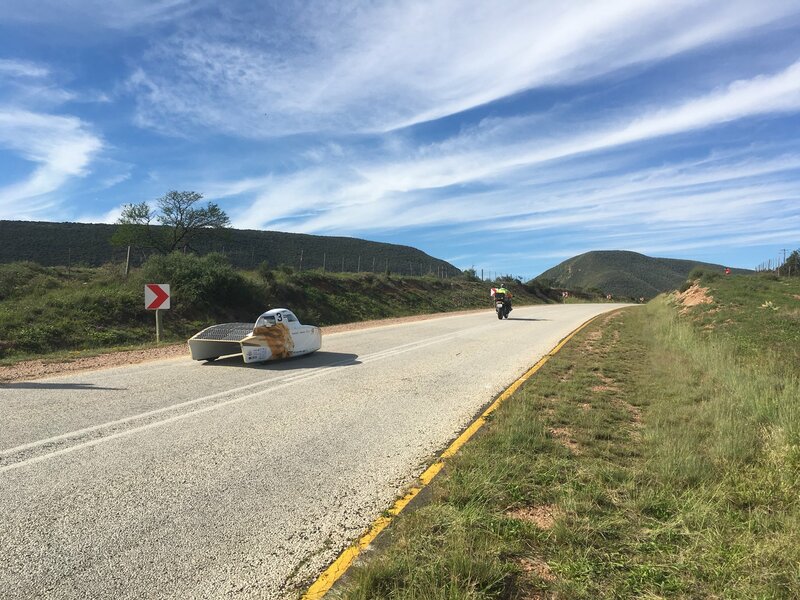 I’m beginning to doubt that Central University of Technology (CUT) or Cape Peninsula University of Technology (CPUT) will ever get their cars working; but they clearly have not yet given up. In hindsight, universities offered the chance to start new teams should have been approached much earlier. 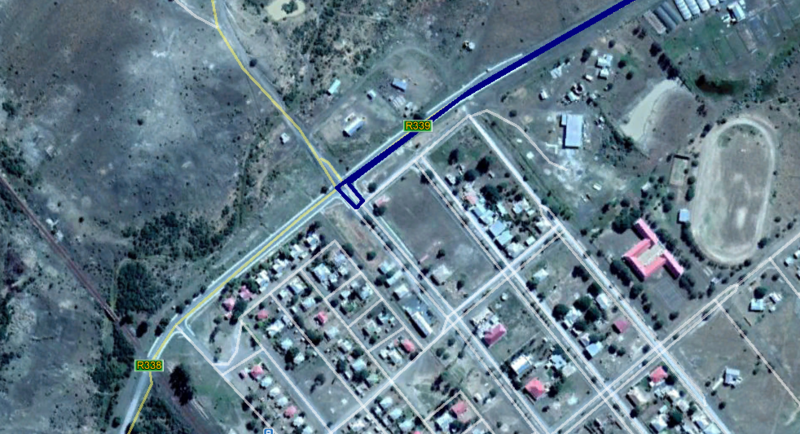 However, Tshwane University of Technology (TUT) has done a fantastic repair job after the storm damage on day 1. I hope that they will be able to make it to Australia next year. 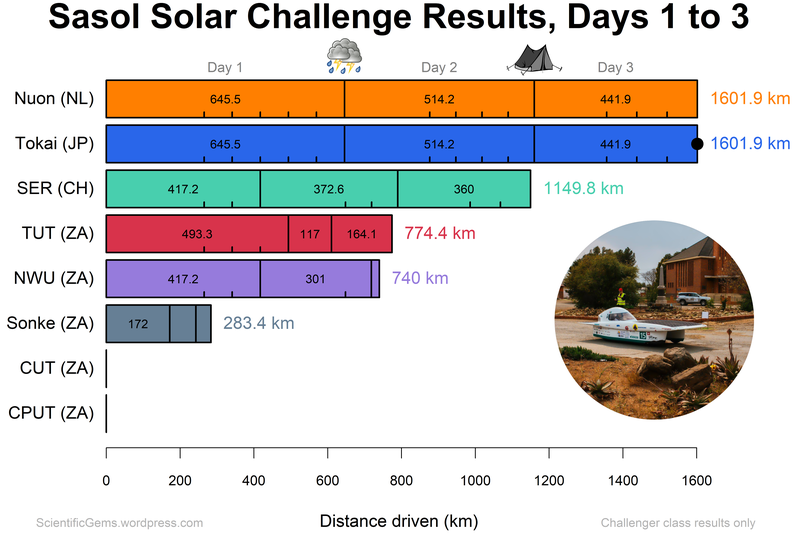 Here are the results for the Sasol Solar Challenge in South Africa, as at day 3 out of 8. The big storm at the end of day 1 is marked. 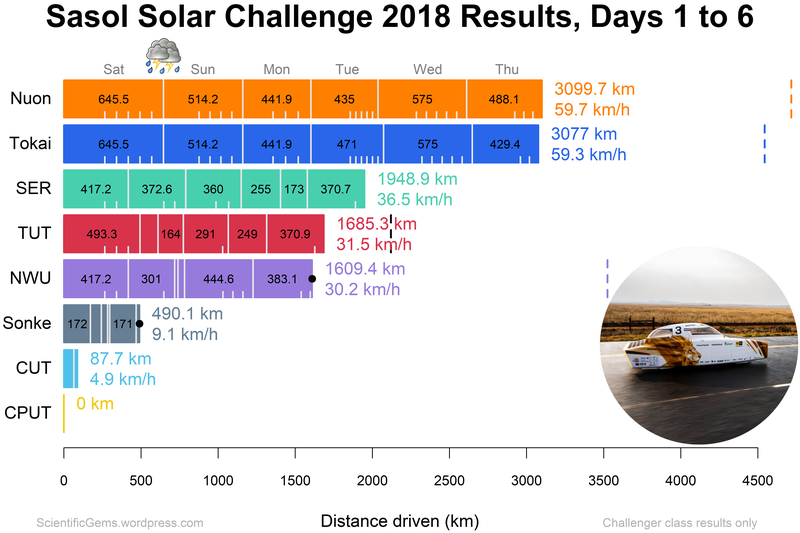 Only the Challenger class is shown (not the car from Hong Kong, which is driving non-competitively). Black spots mark time penalties, and the photo is from here. See also my teams list and information page, which includes links to team social media. 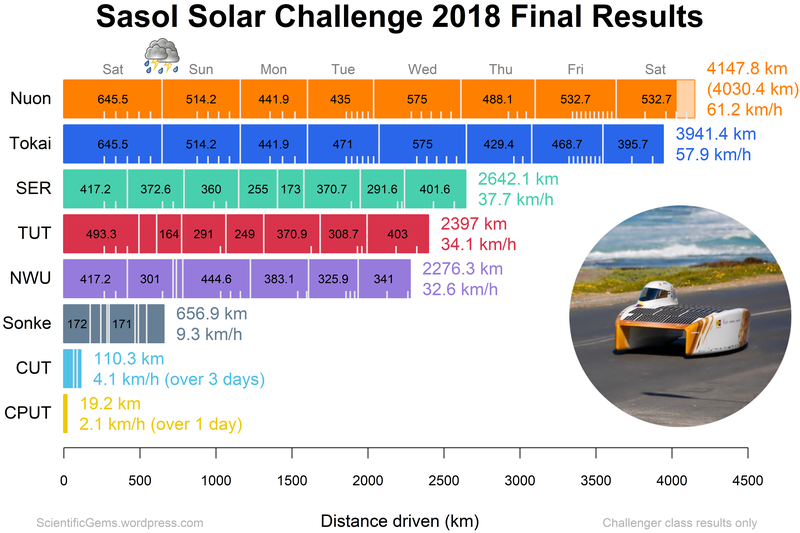 In the Sasol Solar Challenge, teams drive a fixed route each day, with the option of detouring around a “loop” 0, 1, 2, 3, … times. These “loops” are highlighted in the chart above. 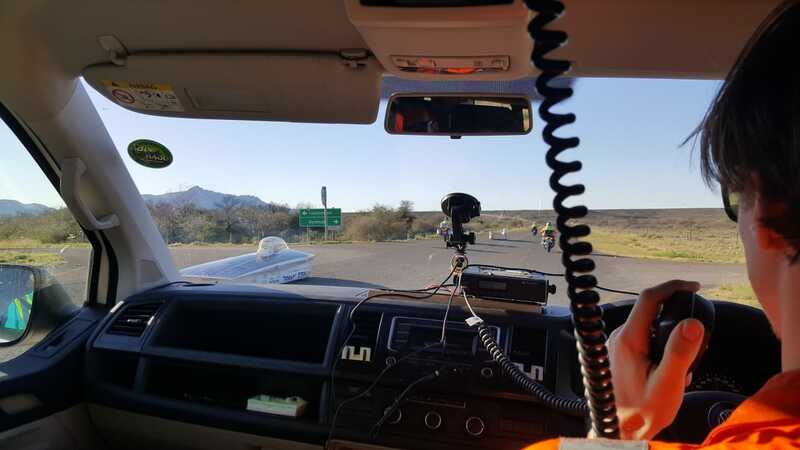 For example, on day 1, Nuon and Tokai both drove the fixed route as well as driving the 76.1 km loop five times (however, these “loops” actually happen somewhere in the middle of the day’s route, not at the end). These “loops” mean that strategy essentially becomes a version of the difficult knapsack problem. Teams must maximise the sum of the lengths of the chosen loops, subject to time and energy constraints. This is further complicated by the uncertainty of future energy input (will it be cloudy in 4 days time?) and the psychological cat-and-mouse between the leaders (something which Nuon generally excels at). It will be interesting to see how Nuon and Tokai play the strategy game over the next 5 days. Nuon has excellent videos about the race (Dutch with English subtitles) for day 1, day 2, and day 3.